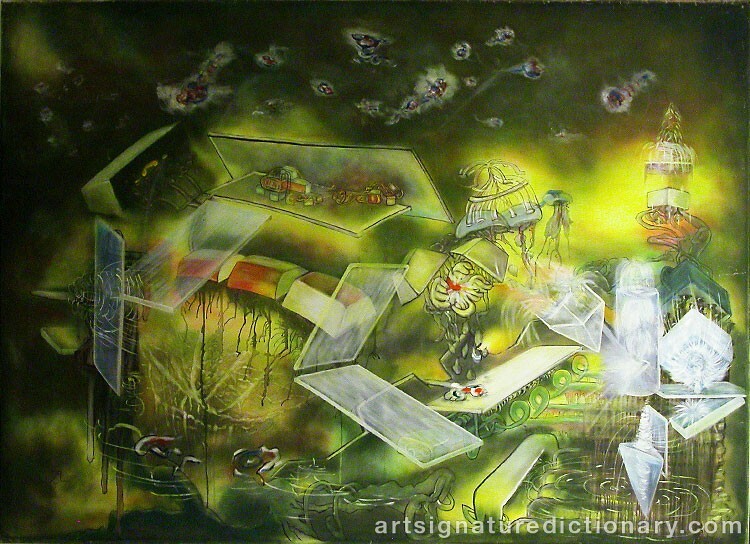 Oil on canvas, composition, signed with Matta's monogram, 98x148 cm. Ostensibly picturing a genuine painting by Roberto Matta. In 2001, January, sold a foreign national resident in Enkoping in Sweden four oil paintings to an art dealer in the Old Town in Stockholm. 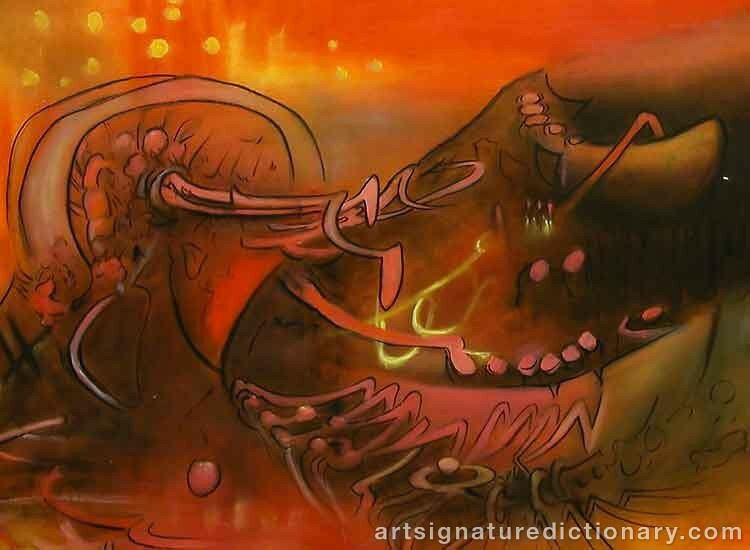 The paintings were copies or pastiches of the Chilean surrealist Roberto Matta, who was then residing in Tarquinia outside Rome in Italy. All the paintings were signed with forged monogram. The seller stated that the paintings belonged to the Shah of Iran. Art dealer who swallowed the fictional story and bought the paintings for about 600,000 Swedish kronor all together. This painting was sent to Sotheby's in New York for sale. 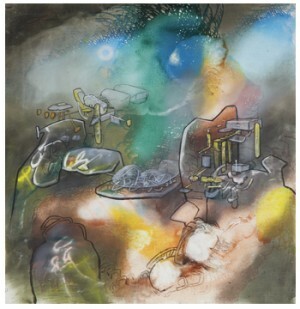 The auction house sent in turn a photograph of the painting to Roberto Matta Foundation, that monitors the rights to Matta's works. They announced that the painting was a forgery. 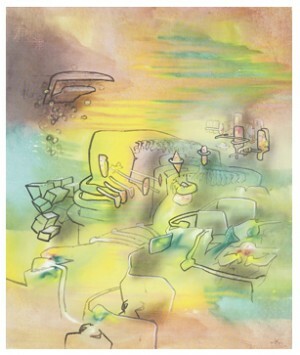 Even Roberto Matta himself confirmed that he never painted this painting when he saw it. 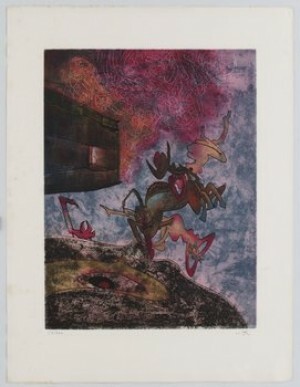 Court: The painting is a "counterfeit", a fake signed pastiche where someone has tried to emulate Roberto Matta. The painting shall be forfeited. Olja på duk, komposition, signerad med Mattas monogram, 98x148 cm. Skenbart föreställande en äkta målning utförd av Roberto Matta. År 2001, januari, sålde en utländsk medborgare bosatt i Enköping fyra stycken oljemålningar till en konsthandel i Gamla Stan i Stockholm. Målningarna var kopior eller pastischer av den Chilenske surrealisten Roberto Matta, som då var bosatt i Tarquinia utanför Rom i Italien. Samtliga var signerade med förfalskade monogram. Säljaren uppgav att målningarna har tillhört shahen av Iran. Konsthandlaren som svalde den uppdiktade historien med hull och hår, köpte målningar för cirka 600.000 kronor tillsammans. Den här målningen skickades till Sotheby’s i New York för försäljning. Auktionsfirman skickade i sin tur ett fotografi av tavlan till Matta Foundation, som bevakar rättigheterna till Mattas verk. De meddelade att målningen var en förfalskning, vilket även Matta själv bekräftade när han fick se den. Domstolens beslut: Målningen är en "helförfalskning", en falsksignerad pastisch där man har försökt efterlikna Roberto Matta. Målningen skall förverkas. 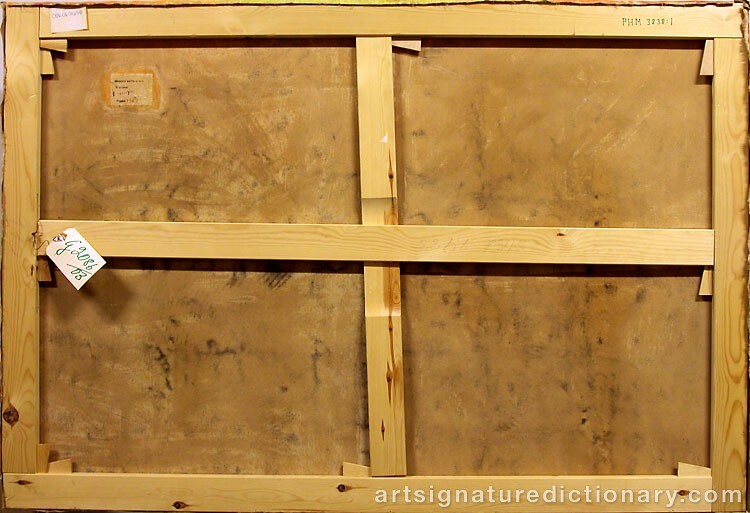 Oil on canvas, composition, signed with Matta's monogram, approx. 110x148 cm. Ostensibly picturing a genuine painting by Roberto Matta. A gallery in Stockholm reports that they probably have been exposed to fraud. 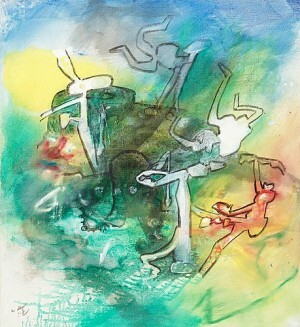 They bought a large painting, signed by Roberto Matta's monogram and suspect that it is a forgery. The painting has stamps and labels showing that it has been exhibited at the Dell Oca in Rome. Upon examination, it appears that Sotheby'si both New York and London has assessed the painting as not genuine when the previous owner tried to leave it for sale. The painting has been seized by police and after examination judged a forgery. Ett galleri i Stockholm anmäler att dom troligen blivit utsatta för bedrägeri. 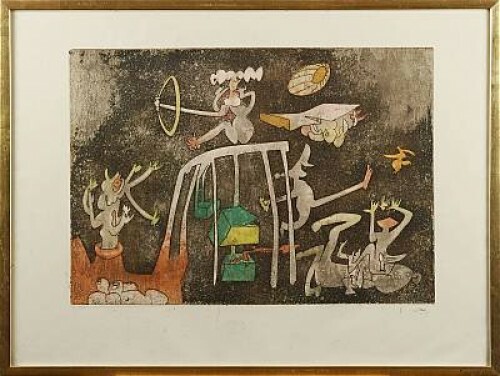 Man har köpt en stor målning, monogramsignerad Roberto Matta och misstänker att det är en förfalskning. Målningen är försedd med stämplar som visar att den varit utställd på Dell-Oca i Rom. Vid undersökning visar det sig att Sotheby´s i både New York och London har refuserat tavlan då den tidigare ägaren försökt lämna den till försäljning. Målningen har tagits i beslag av polis och efter utredning bedömts som en förfalskning. Chilean artist Roberto Sebastian Antonio Matta Echaurren (1911 - 2002) received no formal instruction in the visual arts, yet evolved into one of the most renowned Surrealist painters of all time. Like most Surrealists, the artist, known simply as Matta, dedicated himself to exploring the powerful inner world of the subconscious on canvas. But Matta took the movement one step further, promoting a technique called \"automatic painting,\" in which he attempted to work without thinking. 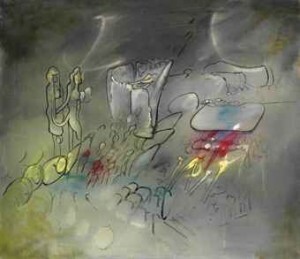 Matta believed that by painting on sheer impulse - with no fore-thought - he could capture the unconscious mind at work. For Matta, this technique yielded a lifetime of peculiar, often hallucinatory images, whose originality greatly influenced the 20th-century art world. Matta was born into a well-to-do, bourgeois family in Santiago, Chile. There is some confusion, however, surrounding the year of his birth. Later in life, Matta gave his birth date as November 11, 1911, although his birth year has been frequently cited as 1912. What is known for certain is that Matta\'s family had ties to the Basque region of northern Spain - Echaurren is a Basque surname. 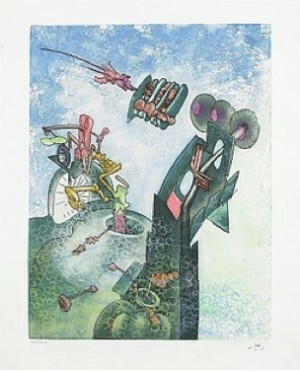 His parents, Don Roberto Matta Echaurren and Mercedes Yanez, were of Basque, Spanish and French descent. Matta\'s father was a landowner, who by some accounts was a distant and awkward father. Matta received a strict Roman Catholic upbringing. From early on, Matta demonstrated a flair for creative endeavors. Santiago was a close-knit community, and Matta grew up surrounded by countless cousins. As a youngster, Matta constructed his own theater, complete with a curtain and colored sheets for a backdrop. He was known for assembling his cousins and making them perform on his makeshift stage. Realizing their son had artist talents, Matta\'s parents encouraged him to become an architect. The Spanish-speaking Matta enrolled at Santiago\'s Sacré Coeur Jesuit College, where classes were taught in French, adding a European touch to his Latin American life. Matta studied architecture and interior design. Next, he studied at Santiago\'s French Catholic university and by 1928 was working in interior design. Soon, Matta began to question his worldview. \"At the age of twenty-one I began to see everything again for the first time,\" Matta said, according to Irene Clurman\'s book Surrealism and the Painting of Matta and Magritte. With this new vision came a yearning for change. By the early 1930s, Matta wanted to leave Chile for Europe. Matta obtained his passage across the ocean by working as a Merchant Marine, docking in Liverpool, England. From there, he headed to his destination of Paris, which at the time flourished as a hangout for aspiring young artists. In Paris, Matta spent two years as an apprentice in the studio of the famed Swiss-born architect Le Corbusier, whose functional architecture impacted modern design. Architecture, however, did not fulfill all of Matta\'s expectations. Matta quit Le Corbusier\'s studio and traveled around Europe. While visiting Spain in the mid-1930s, Matta befriended writers Federico Garcia Lorca and Pablo Neruda. The two were \"Surrealist\" writers who strove to capture the unconscious on paper. 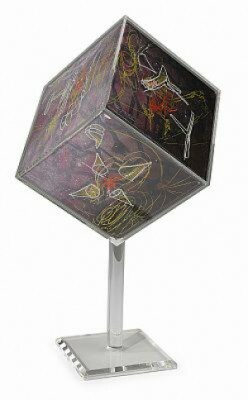 The idea intrigued Matta and began to alter his worldview. 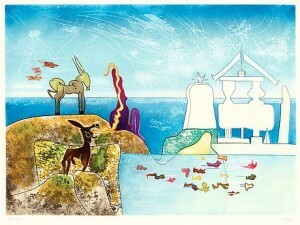 Through Lorca, Matta met Spanish Surrealist painter Salvador Dali. Through Dali, he met Frenchman and poet André Breton, the founder of the Surrealist movement. It was Breton who introduced the idea to Matta that reality was much more than what the human eye could see. Matta expressed his fascination with Breton this way in an interview with Nancy Miller for a retrospective on his work titled Matta: The First Decade: \"If I or anyone was fascinated by Breton, it was because Breton was putting his finger on a very important question - that in representing reality solely by the way it appears to the human eye, we are not representing the whole thing.\"
In time, Matta returned to Paris and again worked as an architectural draftsman, although he was beginning the transformation from architect to artist. 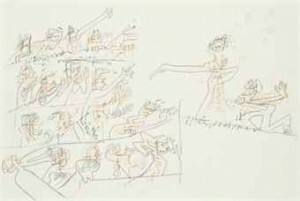 He spent more and more time on his drawings, which he referred to as mere \"doodles.\" Deeply intellectual as well as charming, the Paris Surrealists warmly welcomed Matta into their group. The more Matta hung out with the Surrealists, the more his rigid architectural work - disciplined and ordered - began to bother him. Matta became infatuated with the idea of chance and irrationality, which had no place in architecture. He wanted more than to simply design houses. He wanted to know about the people who would live in them and how they would respond to the environment he created. 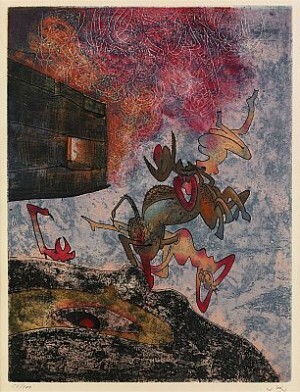 Encouraged by the Surrealists, Matta turned to oil painting around 1938. 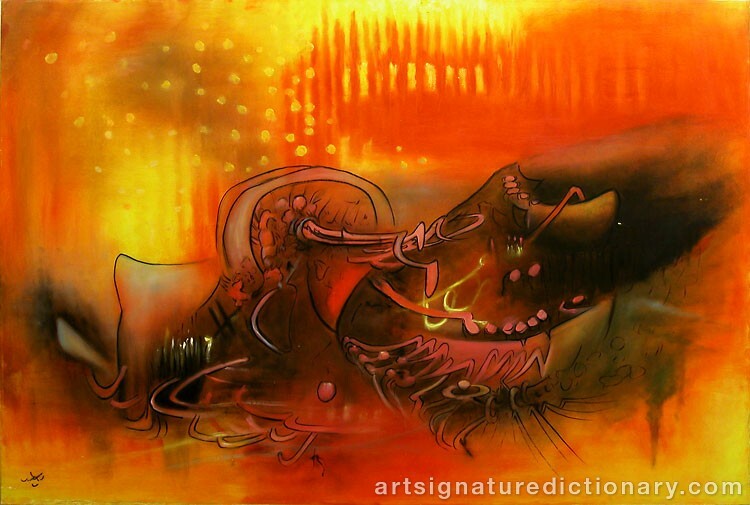 He labeled his first paintings \"psychological morphologies\" and later called them \"inscapes\" because he was attempting to illustrate the landscapes of his inner mind. \"When I started painting, it was through necessity, of trying to find an expression which I call a morphology, of the functioning of one\'s thinking, or one\'s feeling,\" Matta said in the book Matta: A Totemic World. When painting, Matta did not worry about technique. He began most paintings by placing a splotch of paint on the canvas. Next, he would smear the splotch with his fingers, or with paintbrushes and see what image he came up with and what connections he could make from there, hoping he could spontaneously contact his unconscious. 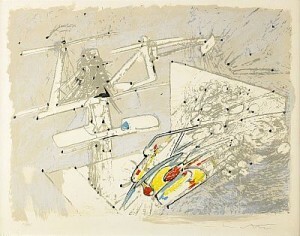 In his interview with Miller for his retrospective, Matta described his method this way: \"I invented my own technique rather than learning my technique as a painter.\" Matta said that he was influenced by Leonardo Da Vinci, who said it was boring to just put lines on paper because then all you are doing is putting down what you already know. Da Vinci encouraged artists to look at a spot on the wall until something appeared through hallucination. Then, they were to follow that image. \"That is my technique. If I see in the spot … something I know, I erase it and wait until something else comes along. And then I see something which to me is fascinating, because I do not know what it is. What appears is something like man - something of being - which is made of forms which come from the whole life history of the human species. I get amused, I get surprised.\"
Though he was only a beginner, Matta\'s paintings were unique enough to warrant exposition at the 1938 international Surrealist exposition at the Beaux-Arts gallery in Paris. 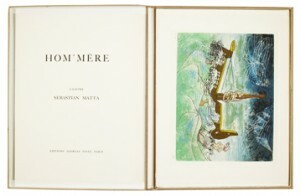 New York Times writer Michael Kimmelman had this to say about Matta\'s first paintings: \"His early Surrealist works, from the late 1930\'s and early \'40s, were meant to suggest primordial upheaval: he painted gelatinous landscapes and cosmic spaces filled with eerie organic shapes in off-key, fluorescent colors.\"
In 1939, after World War II broke out, many of the Paris Surrealists, including Matta, headed for New York City. Of the group, Matta was one of the only ones who spoke English and therefore had a larger impact on the young American artists they met. 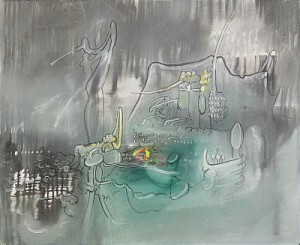 Matta instructed the American artists in his technique of \"automatic painting,\" which helped give rise to the American Abstract Expressionism movement and its painters who came to the limelight in the 1950s - people like Mark Rothko, Jackson Pollock, Arshile Gorky and Robert Motherwell. 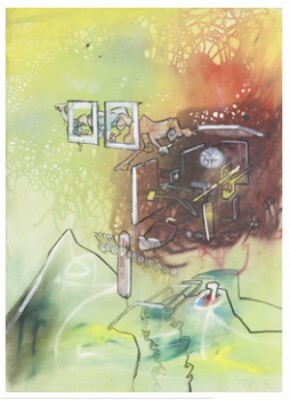 According to Guardian writer Michael McNay, Matta so greatly influenced Motherwell that 30 years later, Motherwell called Matta \"the most energetic, enthusiastic, poetic, charming, brilliant young artist that I\'ve ever met.\" Around this time Matta also began to paint on huge floor-to-ceiling canvases and held his first one-man show in 1940 at New York\'s Julien Levy Gallery. Matta stayed in the United States until 1948, then returned to Paris only to discover that his Surrealist friends had exiled him. Because Matta had had an affair with Gorky\'s wife, they blamed Matta for Gorky\'s suicide and would not let him rejoin their circle. Matta decided to move to Italy, but clearly felt displaced. 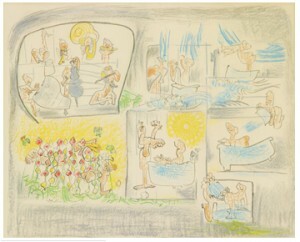 At the time, Matta said, according to the Independent of London: \"It was as if a tree were asked to walk - I had to pack up all my roots again in a suitcase and head off once more.\" Matta lived in Rome from 1950 to 1954, and the Mediterranean culture proved productive for his artwork. 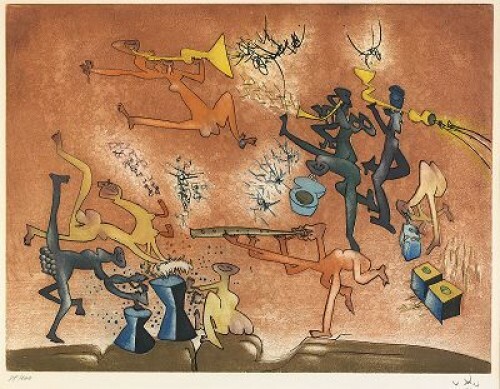 Matta returned to Paris by 1955 and in 1956 painted a substantial mural at the United Nations Educational, Scientific, and Cultural Organization\'s (UNESCO) building. Over the course of his career, Matta\'s works evolved. After World War II, he seemed to focus on the interactions of robots and mutant creatures, taking a man vs. machine approach to his art. 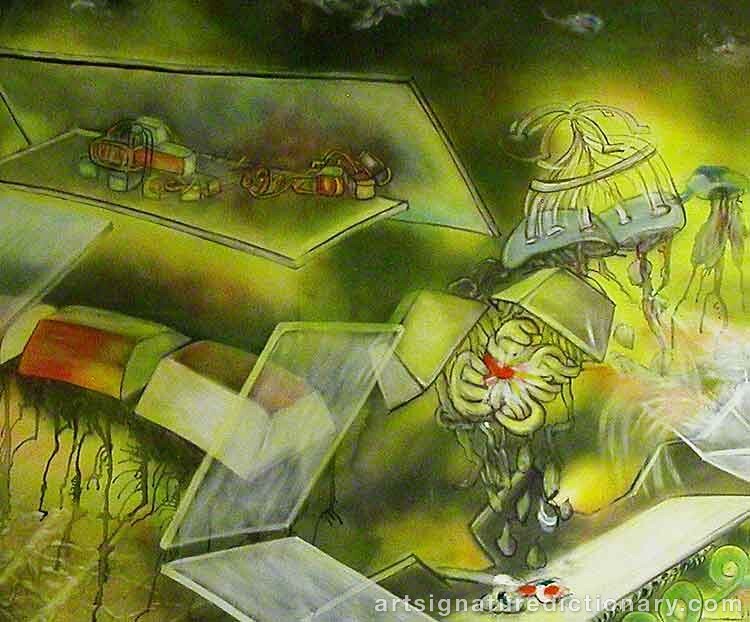 In an article in Americas, B. Mujica describes Matta\'s post-war work this way: \"The paintings of this group constitute a condemnation of modern technology,\" which in Matta\'s view had dehumanized life. In \"Wound Interrogation\" (painted in 1948) \"the wound is separated from the human being and subjected to the torture of intense examination by heinous machines. The bloody red insides of the wound convey a life striving to exist, while the greys and blacks of the demonic robots remind one of an industrial plant.\"
Like most Surrealists, Matta aligned himself with left-wing causes and believed art could be revolutionary. In 1968, he was a keynote speaker at the Havana Cultural Congress, held in Cuba. Here, Matta discussed art and revolution. 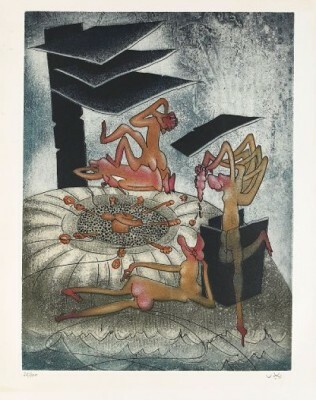 He also produced a number of anti-Vietnam war paintings. 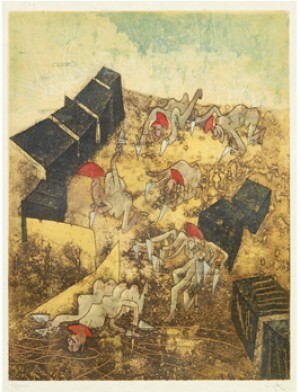 The reach of Matta\'s art was evident in a 1972 international art world poll, which voted him as one of the world\'s 10 greatest living painters. 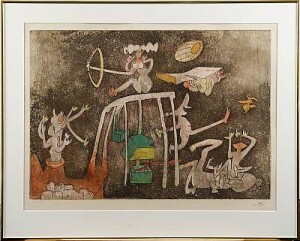 His work was in demand, and during his lifetime, Matta\'s artwork was shown at respectable art houses around the world. Retrospective exhibitions were held at the Museum of Modern Art in New York in 1957, in Stockholm in 1958, in Brussels in 1963, in Berlin in 1970, at London\'s Hayward Gallery in 1977 and at the Pompidou Center in Paris in 1985. Matta never quit creating. He was still painting, designing tapestry and drawing into his last years. He split his time between Paris, London, Milan and Tarquinia, Italy, where he had a studio, gallery and pottery school. He died November 23, 2002, at a hospital in Tarquinia. Over his lifetime, Matta had several children. He and his first wife, Anne Alpert, had twin sons, Sebastian and Gordon Matta-Clark, born in 1943, both of whom became artists. Matta had a second wife named Patricia, who left him for Pierre Matisse, son of the famed artist Henri Matisse. Another artist son, Pablo Echaurren, was born to Matta and Angela Faranda. Federica Matta, also an artist, was born to Matta and Malitte Pope in 1955, followed by a son, Ramuntcho, in 1960. With his last wife, Germana Ferrari Matta, he had a daughter, Alisee, born in 1970. 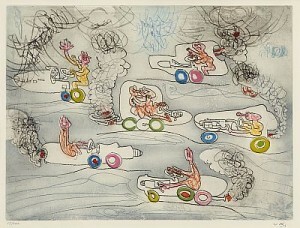 Though Matta was always more popular in Europe than he was in the United States, his works were still being exhibited in the United States at the turn of the 21st century. \"Matta in America,\" a look at his 1940s art, began traveling the United States in 2001, opening at the Los Angeles Museum of Contemporary Art before it traveled to the Miami Art Museum and the Museum of Contemporary Art in Chicago. His work continues to be shown because it is timeless. The introduction to Matta: The First Decade summed up Matta\'s influence by saying that his work remains important because it continues to challenge public attitudes and opinions, questioning a range of topics from American politics to the nature of man and the universe - questions that still resonate with viewers even today. Roberto Matta växte upp i Chile. Han kom i unga år till Paris, där han arbetade tillsammans med Le Corbusier. I Paris kom han i kontakt med surrealisterna, bland andra Salvador Dali, och började måla i en surrealistisk anda. Han har skildrat den teknologiska eran med säregna hybrider av bilogiska och mekaniska former som svävar i en oändlig rymd.